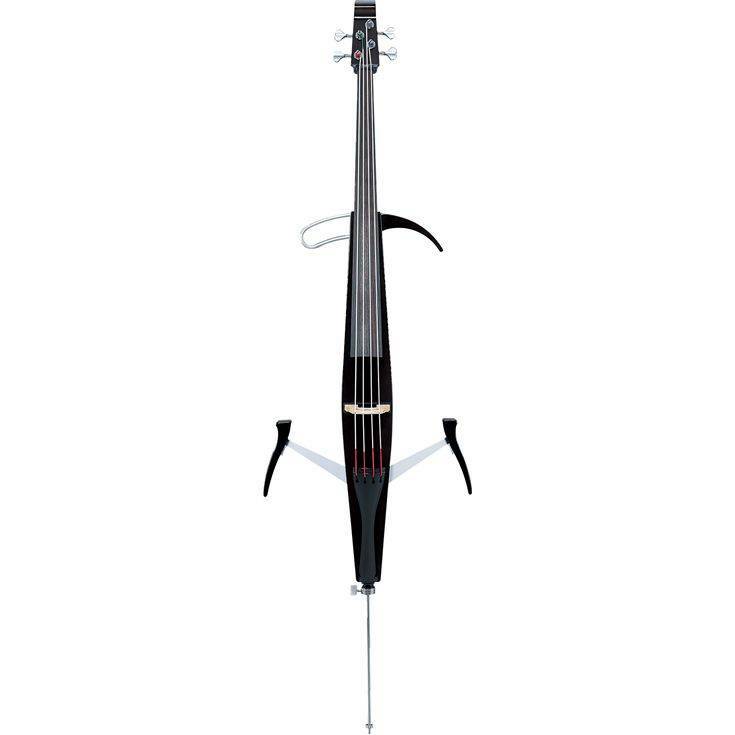 Full size black 4/4 cello is easy to hold and play and the chest support, when attached during performance, offers the natural feel and resonance of an acoustic cello. Protective gig bag and headphones are included! The SVC-50 is designed with slim, compact dimensions that easily break down. The leg supports are a single unit design that is easily removed. Setup is fast and easy with large knobs that quickly attach and firmly fix the supports in place. In addition to the reverb section, the instrument is also equipped with Auxiliary In, Line Out and Headphone Jacks. Four fine tuning adjusters, one per string, make precise tuning quick and easy. Connect a compact disc player, mini disc player or cassette deck to the input jack to play along with your favorite recordings. With the output jack connected to a P.A., or external audio system, you can perform live. Auxiliary volume control provides independent control over the volume of an external audio source. Operates on two SUM-3 (AA) size batteries or optional PA-3B or PA-3C AC power adaptors. Silent electric cello with a solid-body, designed for practice and performance. Tremendous value in an entry-point electric cello. + Nice build. Solid body, solid construction overall. + Convincing, nice cello sound. Not as complex as the higher end SVC-110 and 210 with their resonating chamber, but nothing disappointing. +Built in headphone amplifier, making practice anywhere very manageable. There is a reverb setting with a few room size settings as well, which is nice on the go. It's not as good as using external reverb, but nice to have when you're not plugging in to anything. You need to buy the higher end NS CR cello to have this feature from their lineup. + Leg support is very solid, chest support is decent. Nice to have some points of contact compared to having an electric cello that's just a stick. - Be aware that the stock strings are stiff and not particularly pleasant, however. I used Thomastik-Infeld Dominant (medium), and the sound quality increased dramatically. It sounds quite nice. To be fair, cellos in this price range don't tend to come stock with amazing strings. Should you get this one? In this price range, compared to the NS cello I feel like the Yamaha offers fairly good competition if you're looking for a do-all electric cello, due to the Yamaha being set up better for practice and offering a good sound for the price range. The NS NXt cello offers more value for the money if you are looking for something that will be plugged in whenever playing. The sound quality is very comparable, and it has a switchable piezo system that will optimize pickup for bowing or pizzicato on demand, and the base price is a bit lower.